Having a survival kit is not enough - You must know what to do with it! An emergency can arise at anytime, and everyone from the average commuter to the risk-taking sportsman can benefit from knowing basic survival skills. 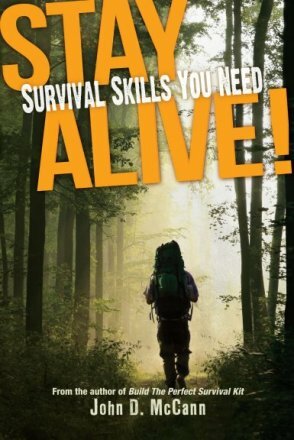 Armed with the techniques in Stay Alive! 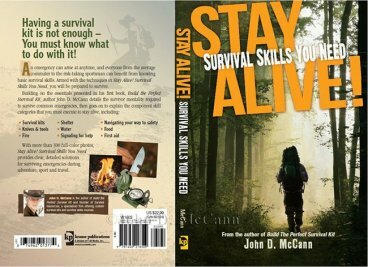 Survival Skills You Need, you will be prepared to survive. Building on the essentials presented in his first book, Build the Perfect Survival Kit, author John D. McCann details the survival mentality required to survive common emergencies, then goes on to explain the component skill categories that you must execute to stay alive, including: · Survival Kits · Shelter · Navigating your way back to safety · Knives & Tools · Water Collection & Purification · Food · Fire & Light · Signaling for help · First Aid With more than 250 pages, 300 full-color photos, and a Foreword by Dave Canterbury (owner of the Pathfinder School and Co-Host of Discovery Channel's Dual Survival), Stay Alive! Survival Skills You Need provides clear, detailed solutions for surviving emergencies during adventure, sport and travel. Note: If you would like a copy signed by the author, and are ordering on line, please indicate the name of the person you want the book signed to under "customer notes" in your shopping cart.